As the roads approach gridlock and public transport struggles to handle the load, time is running out to get Russia’s capital moving. One of the first orders issued by Moscow’s new mayor, Sergei Sobyanin, when he took office in November was for a revamp of the development plan for the capital to 2025. What do the people who will actually be implementing the plan – architects, developers and property consultants – hope to see in this document when it lands on the mayor’s desk in March? It’s no surprise in a city with some of the worst traffic jams in the world that transport is top of the list for most. With President Dmitry Medvedev having told Mr Sobyanin to relieve commuters’ misery, the mayor has already called for more roads. According to Maxim Perov, vice president of the union of Russian architects, Mr Sobyanin should be aiming to practically double the volume of tarmac. “At the moment, no more than 8pc of Moscow’s land is used for roads, while the European average is around 15pc,” Mr Perov says. Clearing the parked cars that block so many traffic lanes is also a popular suggestion, although there’s a vicious circle here. With few car parks in the city, the authorities are lenient with drivers who park badly. At the same time, private investment to build parking facilities is unlikely to arrive as long as drivers face little motivation to pay to park. That’s why commentators say that the city or federal government should build public car parks. This is a prime example of an assertion from Yuri Moiseev, professor of city planning at the Moscow Institute of Architecture, that due to different levels of political and social development, the plan can’t just import models from one city to another. That’s why few commentators believe a congestion charge restricting access to the city centre would work in Moscow as it has in London. For a start, the ageing public transport is already under great strain. Perov says the Metro underground railway needs not just large-scale expansion, but also an upgrade from the “80-year-old technology” it runs on to make it efficient. Mr Millard, meanwhile, points out that there’s a huge volume of surface railway that could contribute to reducing the gridlock. While getting more people into the city centre more easily is a vital goal in the short term, commentators say the city should still be trying to decentralise. Mr Perov claims that “90pc of activity in Moscow takes place on just 10pc of its territory”. However, everyone agrees that large business hubs should be established towards the edges of the city, as is the model throughout Europe. Tigran Hovhannisyan, a property analyst at Uralsib Financial, says there’s “plenty of older buildings that could be renovated and converted to satisfy demand for offices in the centre”. 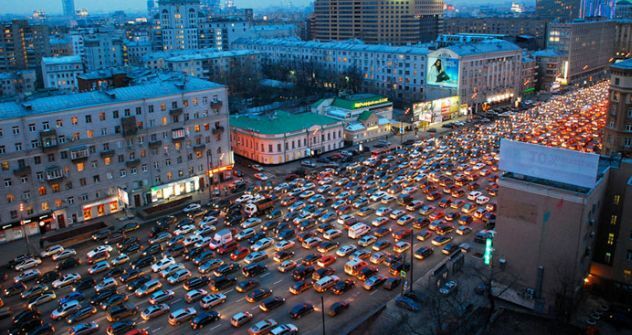 million cars now choke Moscow’s road system, representing a four-fold rise in traffic volume since 1990.
main roads are in urgent need of enlargement, according to the city’s traffic police. million passengers travel each day on Moscow’s overburdened Metro system, which has a total length of 187 miles. Russia’s rail monopoly, RZD, has suggested that opening to passengers the 34-mile freight-only railway line circling Moscow would ease congestion in the capital. Alexander Strelnikov of Moscow’s City Planning Research Institute believes opening the line to passengers would encourage companies to move their offices from the packed city centre to the areas around the ring, reducing congestion and overcrowding on the Metro. “Development used to occur around the circle rail line, but after the opening of the Metro, it has moved to the areas surrounding Metro stations. Some of the areas around the line will need to be reconstructed, but at least the land is cheap,” he told Gazeta.ru. The cost of planning is estimated at 210m roubles (£4.3m). If the rail line is opened, as planned, by 2015, it could handle around 900,000 passengers daily, Gazeta.ru reported.